My friend Maryann Riker has curated an art show and invited myself and seven other local artists to take part in it. The shows’ theme is centralized around the concepts of assemblage art (right up my alley). It’s being hosted at Connexions Gallery in Easton, PA and runs from April 18th – May 16th, 2014. An opening reception is planned for Saturday, May 3rd, from 7 – 10pm. Altered and Assembled is a tribute to the days before Starbucks when cats and chicks wore black turtlenecks and sandals, drank espresso and read confessional poetry by the light of candles stuck in Chianti bottles. It is closing in on 70 years since Jack Kerouac met Allen Ginsberg, and more than 60 since Mr. Ginsberg read “Howl” to a cheering, wine-drinking crowd at the 6 Gallery in San Francisco. A couple of years later, “On the Road” was a pop sensation, and one generation after another since then has rediscovered the beats for itself. Beat culture encompassed nuclear fatalism, libertarian optimism, Eastern mysticism and gritty realism. It was about sexual liberation, and a rootless, footloose, alienated marginalism. The beat spirit was wry, lighthearted and macabre at the same time. It was about breaking down barriers between life and art. Beats celebrated the everyday, down-and-out and ephemeral. They embraced different music styles and black culture. They were early performance artists and crossed over from one art form to another. They experimented with collage, assemblage and stream of consciousness. Artists like DeKooning and Rauschenberg collaborated with writers, film makers and actors. And to understand one art form, it helps to understand the others. So, what is the beat movement’s enduring appeal? It is the essential belief that art and poetry really count: that art is in the world and of the world, that it’s a way of life. 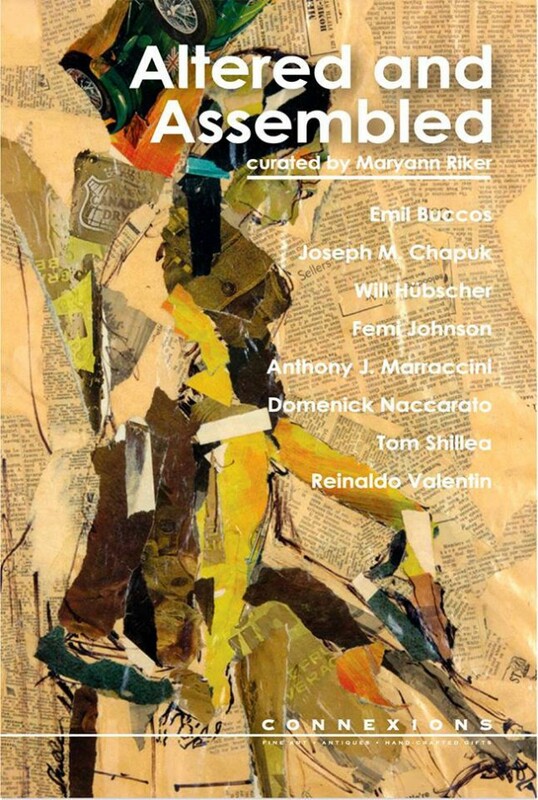 The artists exhibiting in Altered and Assembled embody this concept. From the assemblage works of Emil Buccos, Mick Chapuck, Will Hubscher, Anthony Marracinni, Domenick Naccarato, Will Skrobut and Reinaldo Valentin to the collage works of Femi Johnson and Tom Shillea, each artist looks to other influences and everyday detritus to create their own unique works of art and vision. Some are trained as fine artists while others are outsiders who have looked and created based on their own unique experiences. Like the Beats, they celebrate the everyday that the rest of us overlook to create visual feasts that are thought-provoking and spiritually enriching. Take a moment to open the mind and soul and seek to hear their message celebrating the everyday, the down-and-out and the ephemeral. May you enjoy their works as much as I have enjoyed creating the vision for this show.